As promised, this week we have another piece of art inspired by my recent trip to New York City. 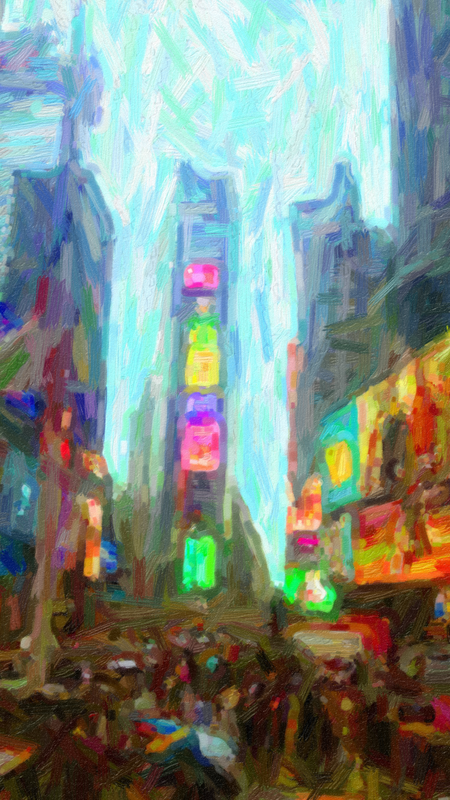 This week it’s a looser Impressionistic piece inspired by the view from Father Duffy’s Steps in Times Square. I have to admit that I was a bit surprised that there was no charge to sit there, it seems like everything else in The Big Apple is monetized, but it was free, and we spent a fair bit of time sitting outside enjoying a light rain and cool breeze, which was a wonderful counterpoint to the nasty heat that’s been plaguing most of the East Coast this summer. In the distance you see the tower of billboards and LED screens that makes up the colorful centerpiece of the Times Square New Year’s Eve celebration. It’s all so overwhelming that I chose a looser style than last week, to give a hint of how much of everything there is just take in. This is a digital painting, and not simply a photo fed through a filter or painted over. I’ve been trying to do more real painting since regaining the use of my fingers a couple of years back, and all the photos I took from this angle had some large guy in a white shirt standing in front of me for some reason. Maybe he thought he was in church, but every time I pointed the camera that way, he’d jump up. Next week, for a change of pace, I’ll be executing a hyper-realistic painting based on a detail from one of the photos I took, which cracked me up. In the meantime, click on this image to enlarge it.